The Samsung Galaxy S4 (one version of it, anyway) and the quasi-revealed Galaxy Note III won't be alone in the Snapdragon 800 family for very much longer. Qualcomm today announced that its nippy processor will support Windows RT 8.1 devices, including tablets, convertibles and notebooks. The news came via a press release tied to Taiwan's Computex, and while it said new devices based on the 800 and Windows RT 8.1 are expected later this year, few other details were as forthcoming. The release noted the chips offer an integrated multimode 3G/4G LTE modem, USB 3.0 support and CPU speeds that can hit 2.2GHz per core... but you already knew that. Unless you've been living under a rock the last few days, it's been hard to miss the mud slung at Windows RT. Even OEM partner Acer saw its CEO say the OS isn't "so influential anymore," though it's arguable it ever was. Windows RT 8.1 and a hopped-up processor may be the shot in the arm the OS needs to get its fire crackling and people buying. Qualcomm's press release said a free Windows RT 8.1 update will be available in the Windows Store before 2013 is up, and attendees of Computex can spy early versions of the updated OS on Snapdragon 800 processors running it right now. 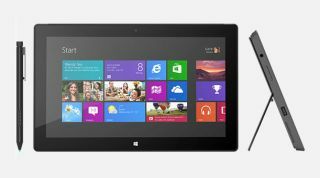 Could we see a follow-up to the original Surface RT hit the shelves by year-end? We'd bet a few chips on that.